Recently, a large manufacturer of case packers required a 3200 series industrial conveyor with a width of 18″ and a length of 18″ (that’s right, a square conveyor). A servo motor provided by the customer was the means to drive this conveyor and it was to be built into the conveyor using as little space as possible. The servo was built into a framework underneath the conveyor and positioned such that the conveyor drive shaft and the servo drive shaft could be linked with pulleys and a timing belt. Precision placement of the shafts allowed for a setup with no tensioner on the timing belt and therefore less maintenance on the conveyor. The final height dimension of the assembly was only 7-1/2″. 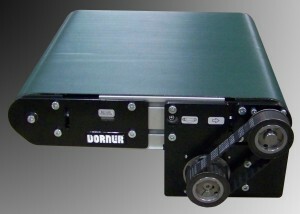 Dorner industrial conveyors have a lot of possibilities in applications that have space restrictions. From servo driven conveyors, in this example, to our space-saving iDrive conveyors, Dorner engineers design conveyors that provide control in small spaces, something we pride ourselves on.